From this block you can learn how to work with JetEngine Dashboard, which allows enabling and disabling modules as well as provides export and import options. From this block you learn how to import and export the ready new post types, taxonomies and listing items. First, navigate to JetEngine block in WordPress Dashboard and here open Skins Manager. Then, click Export Skin button. 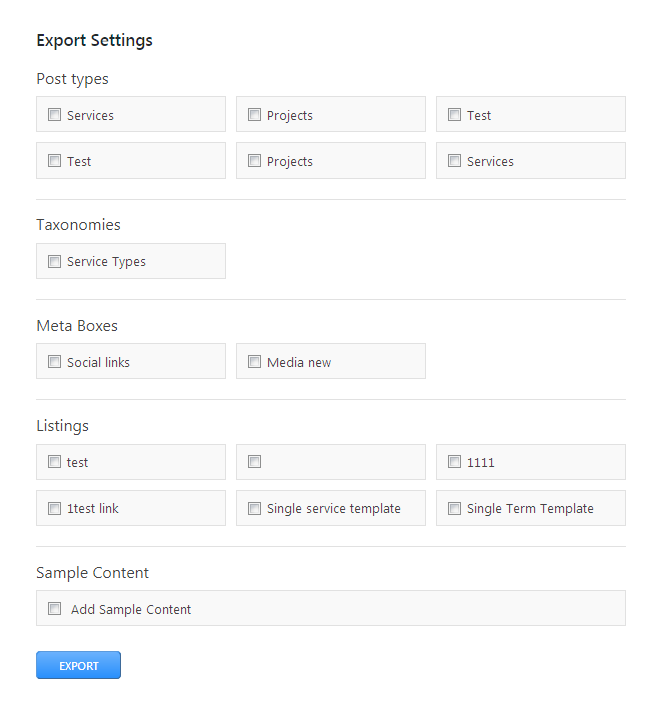 In the Export Settings popup window you'll see the list of post types, taxonomies, meta boxes, listings and samplate content that exist on your site. Check the needed content you want to export to another site where you use JetEngine. Click Save file to save the exported JSON file on your hard drive. First, navigate to JetEngine block in WordPress Dashboard and here open Skins Manager. Then, click Import Skin button. Browse the JSON file which you want to import to your site in order to add your own previously exported post types, listings,taxonomy types, etc. Then click Import Skin button. After the process is successfully finished you'll see the green notice informing you of the content that was imported on your site. From this block you can learn more about the JetEngine Modules mamager and how to use it. First, navigate to JetEngine in WordPress Dashboard. here proceed to Modules Manager. Here you can see the list of available modules that can be enabled or disabled from JetEngine depending on one's needs. Check the needed modules in order to enable or disable them. Them save the changes.